These homilies have been recorded in the hope that they may be of help to you as you prepare for the liturgy on any given weekend. Originally, I thought that listening to what was preached on Sunday may help me improve the message preached on the following Sunday. Recording homilies became part of a routine and soon I had homilies for almost every Sunday for the A, B and C cycles. Please keep in mind that these are not professional recordings, so there will be occasional coughs, crying babies and other background noises. Also, I am the author but not a theologian, scripture scholar or skilled writer: just a priest of 50+ years who would like to pass on what little wisdom has been gleaned over time. Fr. 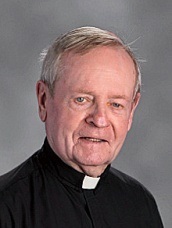 Michael Boyle, the author of the homilies, is a Vincentian priest ordained in 1959. He is now retired and providing assistance to two parishes in Arizona.